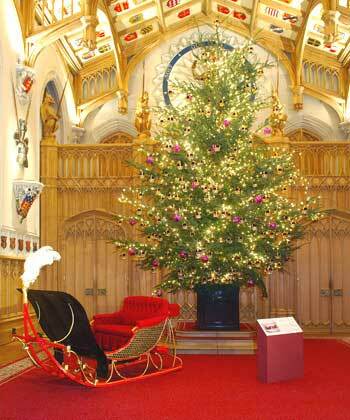 Queen Victoria and Prince Albert spent many Christmases at Windsor Castle, and the queen often enjoyed sleigh rides around Windsor during the winter months. The royal sleigh, built by the carriage-makers Hooper & Co. is painted red and gold, and lined with red velvet. According to contemporary newspaper accounts, Prince Albert drove the sleigh, which was pulled by a pair of horses with harnesses decorated with ostrich plumes and silver bells. The grooms and outriders who accompanied the royal couple were dressed in scarlet livery. 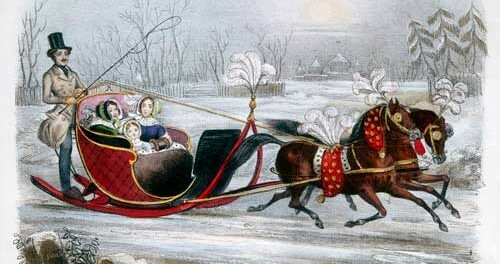 The children travelled in a smaller sleigh, pulled by a pony. Another sharp frost and a fine day – Albert drove Clem and me out in the sledge…with the exception of 2 or 3 little places, we went beautifully and as smoothly as though we were on ice. The sun bright & the sky so blue. We were out for an hour! Photos of wonderful Victorian baby carriages.